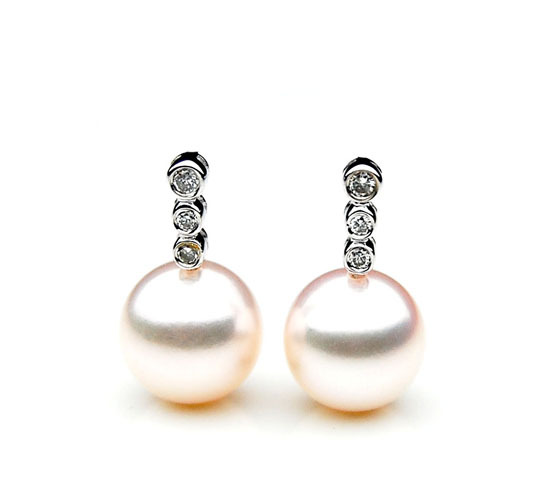 Click the button below to add the AE052 ( AAA 8-8.5mm Japanese Akoya Saltwater Diamond Pearl Earrings 18K Gold to your wish list. Perfect Round 8-8.5mm AAA Quality White Japanese Akoya Saltwater Cultured Pearl Earrings set in 18k (750) White Gold With 0.07 ct Brilliant Diamonds. Akoya pearls are found in Japan , china, and Vietnam . These pearls are farmed in saltwater and grown in oysters. (AKOYA is the Japanese word for saltwater ) Akoya pearls take 10-18 months from the time they are nucleated to the point they are ready for harvest .They are the most difficult and costly to grow because of the low survival rates of their host oysters. less than 50 % of Akoya oyster survive the nucleation process. And less than 5% are considered high quality. Akoya pearls command a higher price more than freshwater pearls. Freshwater mussels are larger and can produce up to 20 pearls at a time, whereas Akoya saltwater oyster are smaller and can only produce one pearl at a time. Luster-Fine Akoya can exhibit the most intense luster of any white round, saltwater cultured pearl. Nacre- The nacre coating is less thick on Akoya pearl than on the south sea types. Nacre Thickness generally averages less than 0.35mm in round pearl. Color-Normally in the white family. The rarest is white with a surface blush of pink; cream shades are also pleasing. Occasionally pearls occur in unusual colors including pink, blue, gold and gray . Japan is also producing a natural color black pearl. Size-range is 2-10mm in diameter, although they rarely exceed 10mm.